GigSalad makes booking entertainment and services for your event safe and easy. When you send messages and payments through our platform, we provide protection and tools you can't get anywhere else. The number one reason for booking through our platform is for the superior protection. 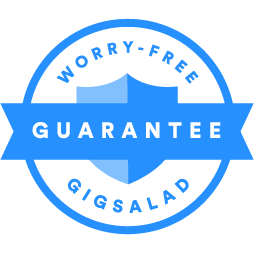 Every event on GigSalad is covered by our 100% Worry-Free Guarantee, so you can rest easy knowing we’ve got your back. All transactions are 100% secure using top-of-the-line encryption and your sensitive information is never stored or shared with an outside party. Plus, in the unlikely event of a vendor cancellation, we offer no-hassle refunds and hands-on support to find a replacement if needed. However, if you book a vendor outside of our platform, we are unable to resolve issues or assist in the rare cases you need us to step in. Read more about our Worry-Free Guarantee. When you communicate or send payments outside of GigSalad, it makes it harder for us to protect your information which puts you at higher risk for fraud and other security issues. If a vendor directs you to communicate or book outside of our platform, we encourage you to decline their request and instead, ask them to send you a proper quote/message through the system so that you can proceed with the booking safely. If you receive a request to share personal information or a message that you feel is fraudulent, please let us know by clicking the flag icon below the message. The GigSalad platform allows you to communicate with multiple vendors, compare quotes, and book your event all in one place. Don't jump between texts, phone calls, Facebook messages, etc. Do it all on GigSalad! All your event details and booking info will be stored in your event planner account for easy reference when you need it. Our site is 100% mobile friendly so you can check your account from anywhere at any time. In the days leading up to your event, we'll send you notifications with all your booking details and tips for preparing for your event. Once the event is over, we'll follow up with you and make it super easy to leave a review for the vendor who helped make your event a success! We hope booking on GigSalad won't be a one-time thing for you. We believe that life should be a party, so you should be celebrating all the time! When you use GigSalad, you'll be a part of an event planning community. We'll send occasional emails with great ideas and planning tips to give you all the party-throwing inspiration you need. And when you book an annual event, we'll touch base each year to offer suggestions for another successful celebration!